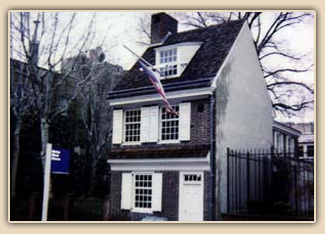 The Betsy Ross House is a two-and-a-half-story brick townhouse associated with Betsy Ross and the creation of the American flag. Although exact construction dates are not known, the front section of the house was likely built in the first half of the 18th century and the rear addition added in the mid-18th century. The building is currently operated as a house museum. The house interior had been altered numerous times over the course of two centuries. As part of a general maintenance and rehabilitation project, we conducted a Building Fabric Analysis to determine the relative dates of various architectural elements. Several years later, we investigated, analyzed and documented the original interior finishes in all rooms that retained mid-to-late 18th-century material. Several images of the first floor rear room, known as the "Flag Room," are presented below. The original finish colors on all wooden elements have been restored: grayish yellow green trim; black baseboards; dark brown window sills and chair rail caps; yellowish white window sashes and whitewashed ceiling (below, left and right). Several 18th-century wallpaper fragments were found under many layers of whitewash in this room. 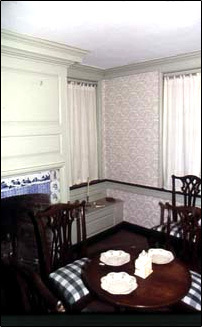 The wallpaper samples, adhered directly to the plaster walls, appeared to be original (below, center). 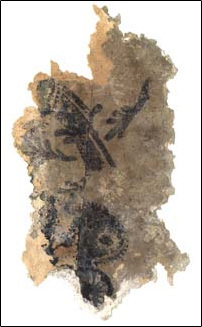 Unfortunately, the fragments of this paper were not large enough to enable reproduction of the original pattern. However, a stylistically similar wallpaper was found in an archive and was known to be available in the mid-to-late 18th century. A reproduction of this wallpaper was hung in the Flag Room to complete the interpretation of original decoration in the room (below, left and right). 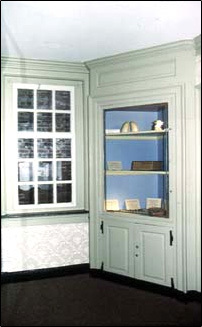 The interior of the Flag Room corner cabinet (below, right) was originally decorated with a bright three-color paint palette - medium blue backboards, a strong reddish orange ceiling and moderate orange yellow shelves. Although these are typical 18th-century colors, the use of all three inside a corner cupboard is unusual.